In 1963 a friend asked Dot Straw to volunteer for the Ricki Rarick Junior Golf Tournament. She enjoyed it so much that she stayed on as a volunteer until 1994. She became Tournament Director after Rarick’s death in 1984. 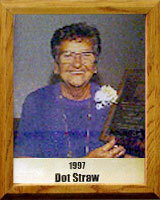 Dot also volunteered for the PGA Tucson Open for 30 years. She started as a driver, transporting the pros to the tournament site. She served on the board of the Southern District Women’s Golf Association as chairman and tournament chairman several times, as well as being active in local clubs, including the El Rio WGA and Silverbell WGA. Dot received the Outstanding Citizen Award from the Mayor of Tucson in 1985; a Citation of Merit from the Governor’s Office in 1985; and was inducted into the Tucson Women’s Sports Association Hall of Fame in 1979. She also received a Special Recognition Award from the Tucson Conquistadores in 1986; was inducted into the Sportsman Hall of Fame in 1992; and received the Arizona Golf Association’s annual Dr. Ed Updegraff Award in 1993.